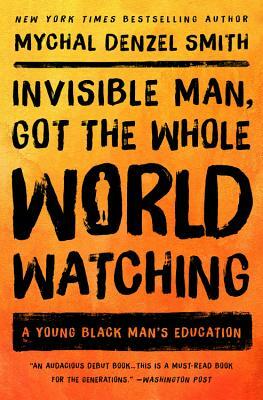 Invisible Man, Got the Whole World Watching: A Young Black Man's Education (Paperback) | Let's Play Books! In Invisible Man, Got the Whole World Watching, Mychal Denzel Smith chronicles his own personal and political education during these tumultuous years, describing his efforts to come into his own in a world that denied his humanity. Smith unapologetically upends reigning assumptions about black masculinity, rewriting the script for black manhood so that depression and anxiety aren't considered taboo, and feminism and LGBTQ rights become part of the fight. The questions Smith asks in this book are urgent--for him, for the martyrs and the tokens, and for the Trayvons that could have been and are still waiting. Mychal Denzel Smith is a Knobler Fellow at the Nation Institute and a contributing writer for the Nation magazine. He has also written for the New York Times, The Atlantic, Salon, Feministing.com, The Guardian, The Root, theGrio, ThinkProgress, and Huffington Post, and he has been a featured commentator on NPR, BBC radio, CNN, MSNBC, Al Jazeera America, HuffPost Live, and a number of other radio and television programs.